CCI (Commodity Channel Index) was developed in 1980 by Donald Lambert. This indicator is an oscillator which helps to identify overbought or oversold markets periods, like the majority of indicators in this category. This is a linear oscillator that looks like RSI, but has its own features and advantages. What is special about the CCI indicator and what is the most effective way to use it in trading? The CCI indicator shows when the current price level is far above/below the moving average. The moving average period is set by the trader. The stronger the price deviation in the short term relative to its averaged value, the higher (in case of an uptrend) or lower (a downtrend) the oscillator line will go from the zero point. Most of the time the indicator line oscillates between levels +100 and -100. When the line leaves this range, you get a signal about asset being overbought or oversold. This is a basic signal of the Commodity Channel Index. CCI, unlike RSI or Stochastic Oscillator, is not limited by levels +100 and -100. The Commodity Channel Index line may fall to levels -200 and -300, which will only indicate that the downtrend is very strong and the market is in a state of deep oversold. In this formula “Typical Price” is the arithmetic mean of any candle minimum, maximum and close values. SMA is a regular moving average line that is plotted by typical prices within a given period. 0.015 is the experimentally determined constant. Standard Deviation is a simple moving average plotted not by typical prices, but by value (Typical Price – SMA). That is, first you need to subtract a simple moving average value from the typical price value, and then average the obtained value by the SMA formula once again. The moving average period is always the same. 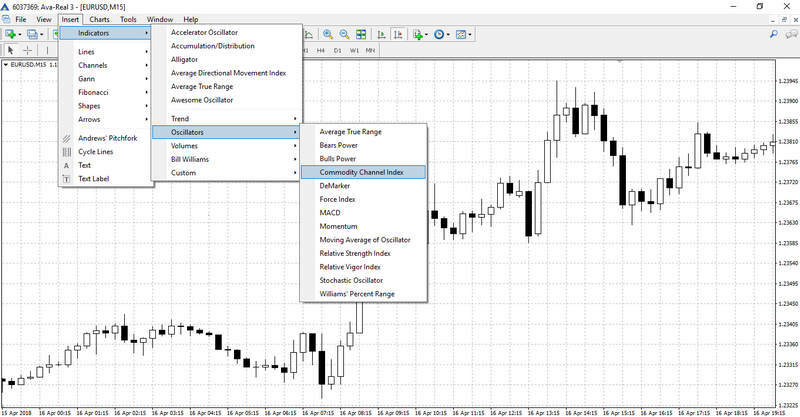 You have to select “Insert” – “Indicators” in the platform’s main menu and then find “Commodity Channel Index” in “Oscillators”. Click “Indicators list” icon (with a green plus) on the top of the toolbar. 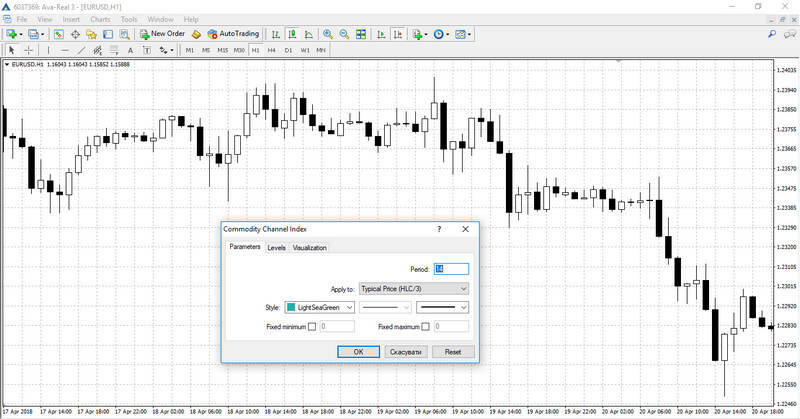 Select “Oscillators” – “Commodity Channel Index”. The second version is a little faster and more convenient in practice. Indicator’s settings window will open after selecting it on the chart. The only parameter that can be changed is the period, but it affects all values in the indicator’s formula. Indicator’s sharpness depends on the period value as it is in other oscillators. The CCI line will move quickly from level to level when the period is small and it will move smoothly, oscillating mostly around the zero point, when the period is large. Also horizontal levels can be added or removed in “Levels” tab in the settings window. The most effective way to use the Commodity Channel Index, like the majority of oscillators, is to use it as a filter. 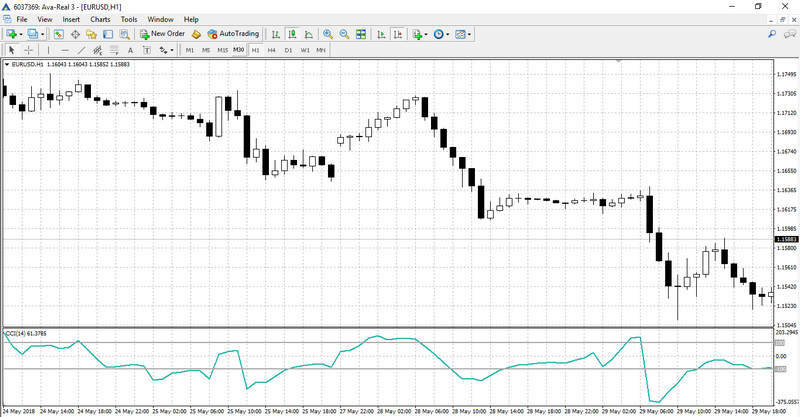 However, this indicator can also provide highly reliable signals to enter the market. When the CCI indicator line crosses level +100 from below, then reverses and crosses it in the opposite direction, a sell order is opened. When the indicator’s line falls below level -100 and then crosses it in the opposite direction, a buy signal appears. It is worth noting that such signals appear quite often and many of them turn out to be false in the end. It is better to add an additional indicator to the system or to increase the normal oscillation range in order to filter false signals. The overbought/oversold levels can be moved to +150/-150 or +200/-200 for this matter. 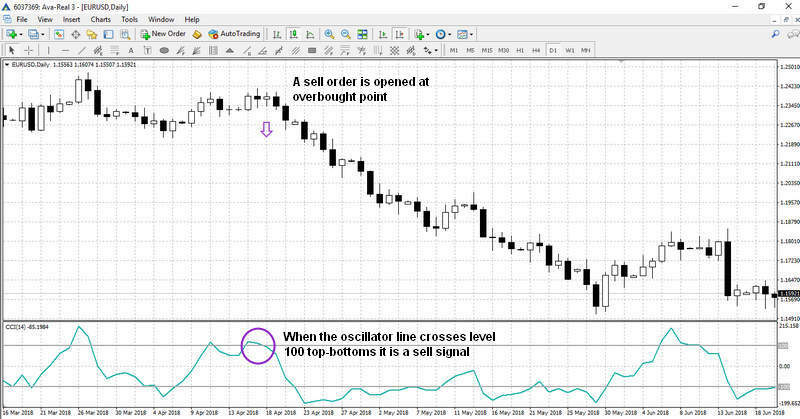 Divergence is considered to be one of the strongest oscillator signals. Explicit divergences and convergences are formed much less often than just entering overbought and oversold zones, and therefore they produce a more reliable signal. Convergence and divergence can be identified by drawing lines through two or more local extrema on the graph and the respective local indicator extrema. When the trend line on the price chart and the trend line on the indicator are moving in the opposite directions, there is high probability of trend changing. When at the time of an uptrend the last local maximum is higher than the previous one (the line connecting them is directed upwards) and the last local indicator extremum is lower than the previous one (the line is directed downwards), a sell order is opened. When at the time of a downtrend the last minimum is lower than the previous one and the last minimum of the indicator is higher than the previous one, a buy order is opened. You can also exit orders with the Commodity Channel Index signals, when the line crosses the indicator in the opposite range. Each order must be protected with a stop loss (set on a local extremum or at a key price level). Let us add one more indicator – a simple moving average with period 100– to the CCI system in order to improve signals quality and, accordingly, trading efficiency. 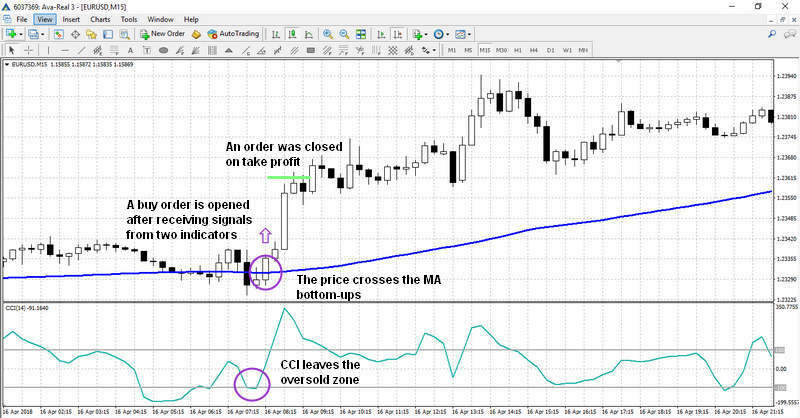 It is better to use the CCI + MA strategy for short-term trading, opening orders when prices retrace from MA. The moving average will be used as a support/resistance line in this case. M15 is the optimal time frame for trading, but let us also add scalping at M5. When CCI leaves the oversold zone, and the price line intersects the moving average chart from below, a buy order is opened. When CCI crosses the +100 level from below, and the price crosses the moving average in the same direction, a sell order is opened. The easiest way to exit an order is with fixed stop losses and take profits. The main thing is to maintain the 3:1 P/L ratio (for example, planning to make 30 points profit with 10 points of affordable losses in one order). 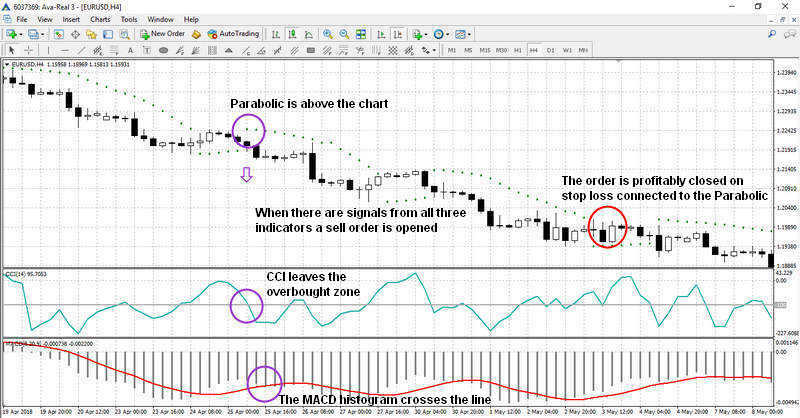 In conclusion, let us take a look at a more complex CCI strategy which, nevertheless, is suitable both for beginners and professional Forex traders. Beginners will be able to quickly understand the strategy through clear entry-exit rules, and experienced traders will be able to improve the system and achieve even greater efficiency with it. All indicators in the system (CCI, MACD and Parabolic SAR) are set with the default settings. H4 is the optimal time frame for trading. The Parabolic SAR marker changes position and is placed above the chart. The MACD histogram crosses the line. CCI leaves the overbought zone and falls below level +100. Buy orders are opened on the opposite conditions. This system offers some flexibility with closing the positions. Given the 4-hour timeframe, a trader can manually move the stop loss, setting the exit price using the Parabolic marker. Thus, you can capitalise on the entire trend without limiting your profit to a pre-set level. 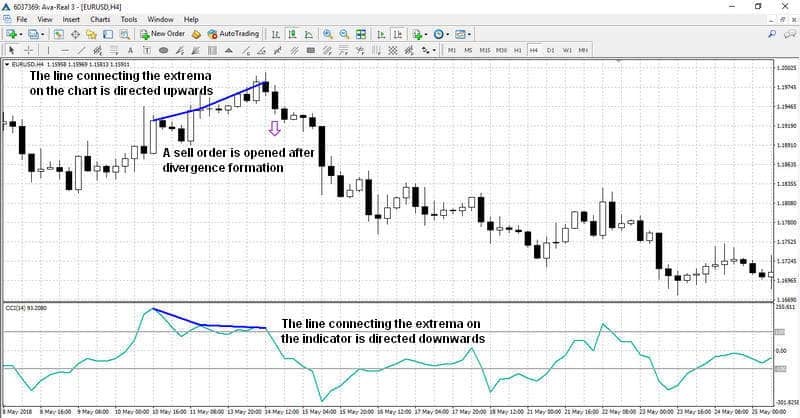 This trading strategy best results for Forex trading, but it is not recommended for shares or cryptocurrency trading since different instruments tend to have different price action dynamics. The Commodity Channel Index is a reliable and effective indicator, but it has its disadvantages as well. More specifically, it is good for identifying market entry points (especially in conjunction with other indicators), but it is better to use traditional signals for closing the positions. The thing is that when a strong trend is present, CCI moves quite quickly from the overbought to the oversold zone and vice versa, and if this is perceived as a reversal signal, most of the profit from the original position can be lost. All in all, CCI is a good “team player” which shows good results in conjunction with other indicators. However, it is not a good idea to open orders using only The Commodity Channel Index signals, because CCI, like the majority of oscillators, is first of all a filter created for elimination of other indicators’ false signals.